I pray that God blesses you and your families with a wonderful and safe Friday. Spend time with Christ this weekend. Ask yourself what you can do to grow closer to God. If you want to hear from Christ, seek Him. If you want to recognize His voice when He speaks, spend time at His feet and not chasing His hand to give you stuff. Seek God on a new level. Seek Him to know Him. To know Him is to love Him more. PRAISE THE LORD for a new day! Happy Thursday to you all! I don’t know about you, but the last couple of weeks have been filled with test and trials, but God continues to stand with me in each and every situation. I am so glad Friday-Eve is here. I pray that you have a wonderful day! Keep praising God in the good and the bad. Allow your positive attitude to catch on like a wild-fire. Ignite your surroundings with a joy that resides in your heart. Smile! Think about it-it could have been worst, but GOD!!! Have a wonderful day! We have been justified by faith, that means we have been defended and excused from all of our wrong doings by the blood of God. Since we have been justified, we are able to walk in peace with God through our Lord Jesus Christ. Stop allowing the guilt of your past, the shame from your mistakes, or even people to keep you from walking in peace. You no longer have to walk around worried about everything. Your sins have been forgiven. You have been washed by the blood of the lamb. Stop allowing a sin that you repented over and got right with God to keep you walking in fear and shame. Walk in peace. God has said that you can walk in peace. He has excused you of your sins. 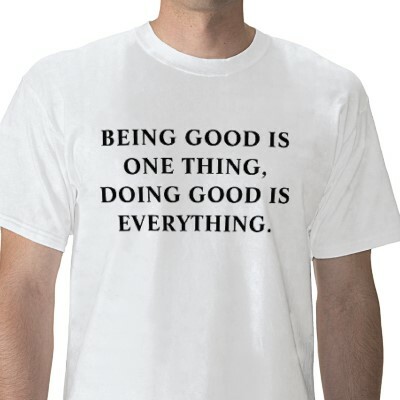 I know you might think that you have done some terrible things, but you don’t have to walk around in guilt. Let that stuff go the moment you give it to God and walk in peace. God is so awesome that before you were even formed in your mother’s womb He sent His Only Son to carry your sins to the cross. God loves you that much to forgive you while you were wallowing around in sin, stop allowing your flesh to beat you down. WALK IN PEACE. YOU ARE CLEANSED BY THE BLOOD. Each day you should rejoice in who you are in Christ. Make a conscious decision to live for God and know that you can walk in peace! There is peace in Christ so live by Him. Don’t live by the world’s standards or you will not have peace. Don’t live by your own standards or you will not have peace. Peace comes from GOD. LIVE FOR CHRIST AND EXPERIENCE HIS PEACE!!! Good Morning! I pray that everyone had a blessed weekend and a wonderful Monday. Life is busy in the land of “ME”. I pray this poem is a blessing to you. Enjoy your day and never allow anyone to discriminate on your praise! Join me as we praise God today! Sometimes “church” people can be so critical of others. Instead of wondering why a person praises God the way that they do, join them and rejoice for their breakthrough. Stop turning your nose up at their praise. Stop secretly wishing that they would be quiet and stop all that noise. You never know what someone went through in order to push their praise out. Stop being so critical, kick off your shoes and join them in a shout. God bless. Does love conquer all? We’ll you must first know the meaning of love. Webster dictionary tells us that love is a feeling of strong attachment induced by that which delights or commands admiration. The problem is the world believes love is just a feeling. Love is so much more than a feeling. You must know that God is love (1 John 4:8). If you don’t know God, then you do not know love. You haven’t even begun to experience what love is if you don’t know God. The best definition of love comes in 1 Corinthians 13. Read the entire chapter during your devotional time. The question is does love conquer all? We’ll the answer is YES. Since God is love and God conquers all then love conquers all! God conquered death, hell, and the grave, surely He can conquer all of your problems. If you truly focus on God and look at Him as an example then you can learn how to love others. We are incapable of loving without God. We allow our emotions to run us ragged. We are angry one moment, bitter the next, happy one second, strong then weak, we are ever-changing. So our flesh may tell us that “love” can’t conquer all because we were hurt by someone we loved. We use love so loosely that most of the time we are just infatuated with an ideal and when disappointment strikes we say “love stinks”. But when we love and put God first and mimic His standard for love then love can’t and won’t stink. Love covers a multitude of sins and love conquers all. When I read 1 Corinthians Chapter 13 I can’t help but rejoice in knowing that love never fails!!! God never fails!!! When you put God in the center of your relationships (marriage, family, church, etc.) then love will conquer all. Love will conquer the lies, the abuse, the misuse, the unforgiveness, and more. YOU HAVE TO PUT GOD IN THE CENTER OF YOUR LIFE! LOVE WILL CONQUER ALL!!! Calling all young adults ages 18-35ish!!! 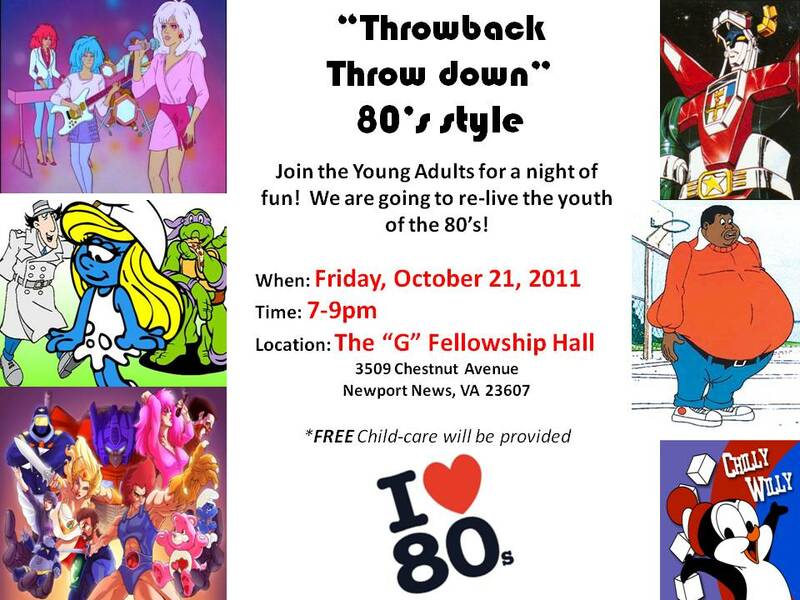 Join us for a fun-filled night re-living the 80’s. Travel back in time with us as we reminisce on the cartoons of the 80’s. What was your favorite cartoon character? What was your favorite school yard chant? What was your favorite snack? We are going to play school yard games…are there any DOUBLE DUTCHERS out there??? Who is the “baddest” on the hula hoop??? We’ll it’s going down on October 21st and we need you to be there!!! Tell everyone you know. We will have games, contest, 80’s photos and so much more. This will be a night where you can forget about the worries of tomorrow and just be a kid for one night. More details to follow…start spreading the word. P.s. FREE Child-care will be provided!!!! Good afternoon! Happy Monday. I pray that you had a wonderful weekend! Remember God still sits on the throne. I was ironing my shirt this morning, something that I rarely do, and God gave me divine revelation through something as simple as ironing. The top that I am wearing today is linen and I had to look on the iron to see which heat setting to apply to properly get the wrinkles out of this top. To my surprise linen needed the hottest setting with the right amount of steam to smooth out the garment. Then God took my attention to the different fabrics listed on the iron and their settings. Each type of fabric needed a certain amount of heat, some needed steam, and some needed dry heat in order to remove the wrinkles. This is like life, we are all different people and face different situations, but we all need a certain amount of heat to smooth out the chaos in our lives. You see a top made of Rayon doesn’t need that much heat but a linen top needs a lot of heat. Look at your sin like God looks at fabric. You may be dealing with a delicate situation that doesn’t require too much heat, but it still needs heat to become refined. The more sin you fall in the more heat you need applied to your situation. This is all done to smooth your situation out and cause you to walk on a straight and narrow path. As you grow in Christ, He is redefining you. He has to apply heat to remove all impurities within you. Heat is necessary for us to grow. We all need to be put through the fire at some point in our life. Sometimes we are put through the fire as a result of our sin and God has to make us clean again and other times we are put through the fire to make us stronger in Christ. No matter what the situation may be, just know that HEAT IS NECESSARY! I pray that you have a blessed day! Spend time with Christ daily! Good morning! I pray that God continues to bless each and every one of you. I pray that you have a blessed day! Take time to see God for who He is. I pray that your desire is to be more like Him. 2 For with what judgment you judge, you will be judged; and with the measure you use, it will be measured back to you. 3 And why do you look at the speck in your brother’s eye, but do not consider the plank in your own eye? 4 Or how can you say to your brother, ‘Let me remove the speck from your eye’; and look, a plank is in your own eye? 5 Hypocrite! First remove the plank from your own eye, and then you will see clearly to remove the speck from your brother’s eye. When offering people correction, criticism, or advice we have to be careful because people are more likely to follow our actions before they follow our word. As a child, I was told to “do as I say, not as I do.” When I was younger I interpreted this to mean, “I am the parent and I make the rules so listen and do what I tell you to do.” Now this statement worked, but it caused me to question a lot of things as a child. I’ve discovered a fundamental problem with this statement. It allows people to live and behave contrary to the way they speak. It implies that a person will not do right in their actions, so they don’t want you to follow what they do, but follow what they say. This is a dangerous position to take. I believe the statement should be, “Do as I do and do as I say” because my actions will not contradict my speech. We can’t tell our children not to smoke, but we light up a cigarette every day. We can’t tell our children not to curse, but we cuss out anyone who gets on our bad side. We can’t offer a person advice on their finances if our finances are jacked up. We can’t condemn someone for not forgiving, when we walk around with a harden heart towards others. A person is less likely to take your advice in an area that you are currently struggling or messing up in. When people can see your challenges then it damages your credibility. It’s time to stop spending so much time focusing on other people’s flaws and start allowing God to work in our life. When your actions begin changing and lining up with your speech you will encourage someone else to do the same in their life. Actions speak louder than words. Have you ever wondered why certain people never take your advice on a particular subject? It could be that they consider the source of the information. Some people may not want your help because you are always trying to tell them how to live their life, but your life is jacked up. Why should a person take advice on having a successful relationship from a person who is always struggling in relationships? Why should someone get advice on buying a house from someone who has never bought a house. Sometimes we have to exercise wisdom and stay in our lane. We need to speak less and do more. I’ll repeat that, we need to speak less and DO MORE. Stop giving unsolicited advice to people. Your intentions may be good, but they will not be received. You may damage your opportunity to help someone if you spend so much time trying to fix their situation and your situation is left in shambles. Some people focus more on other people’s flaws in an effort to escape their mess. Don’t be that person. Let God fix you and watch Him use you to help others by not even speaking a word. People will follow your actions before they follow your words. SO LET’S STOP TALKING ABOUT IT SO MUCH AND START BEING ABOUT GOD’s BUSINESS. Don’t be a hypocrite. Fix the plank in your eye and then the person with the speck in their eye may be ready to receive your help. Good morning! Happy Friday! Praise God for watching over everyone during this week! Take time to give God praise for being God! Pain is defined as physical suffering or distress, as due to injury, illness, etc. It is also a distressing sensation in a particular part of the body such as a back pain. Pain is not limited to physical but can also be mental or emotional suffering or torment. Pain is something that is necessary in life. Though we don’t like to experience it, we must learn to appreciate that it helps produce character, moves us into a deeper relationship with Christ, allows us to enhance our testimony and so much more. I’ve been reflecting on my personal life lately and how I’ve been creating new habits to become a spiritually and physically healthier “me”. I’ve been waking up at 5:00a.m. in the morning to meet God for some quiet time, then I exercise each morning and prepare for my work day. Let me tell you, I have experienced some pain. There are times when I don’t want to get up that early (especially since I don’t have to be at work until 8:00a.m. ), but I know it’s necessary for me to grow spiritually. I’m not speaking for anyone else, but I need to seek God early in the morning. There are times when I exercise and it hurts, I mean it’s physically excruciating and the pain makes me want to quit. Sometimes I want to give up, but God reminds me that the pain is necessary in order for me to change and get the results that I desire. This is also true in the spiritual. When you desire to change and grow spiritually you will go through some pain and you may want to give up and quit, but you have to endure. God never promised that this life would be easy. He told us that our days are numbered and full of trouble. In order to get better and reach your desired or shall I say God’s desired state for your life you have to endure the pain. I had an epiphany that the pain of remaining the same is far worst than the pain I have to experience as I grow towards change. When look at where I cam from spiritually, physically, emotionally, and mentally, it’s worth the pain. The pain I endure to grow spiritually is worth who I will become. I refuse to be the “old” me because God has made me a new creature. Remember it’s necessary to endure some pain for a long-term gain. No matter what you do in life it will not be easy, but it is necessary to grow. God even allowed me to look at when babies hit growth spurts they become uncomfortable and cranky when their bones are stretching. They are going through growing pains. Those pains are necessary for them to grow strong and tall. The blessing is the pain is temporary. Ask yourself: What am I willing to go through in order to grow spiritually, mentally, physically, and emotionally? God does not allow us to endure pain without a reason. Instead of asking God to stop the pain, ask Him to help you endure the pain. Pain is necessary to take you to the next level. It will make you stronger. And one day someone will need to lean on you with your new-found strength. 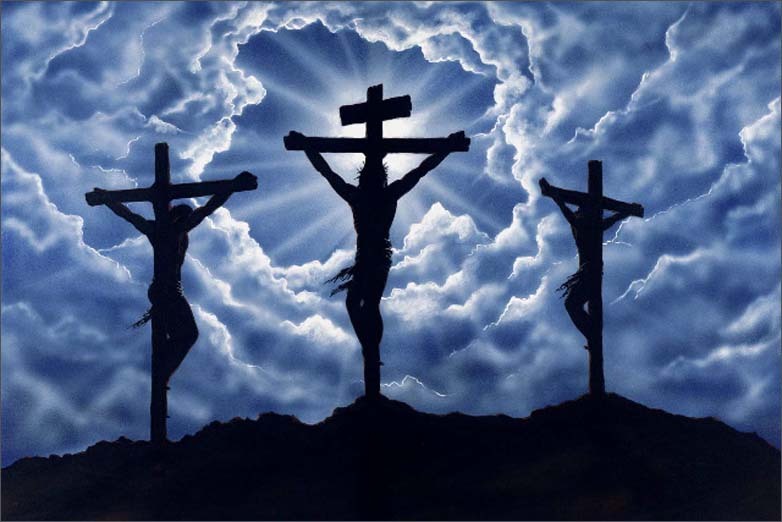 The next time you think about giving up, think about the pain that Jesus endured for you! HE DIDN’T QUIT! Good morning! Happy Tuesday to you all! I pray that everyone enjoyed their Labor day weekend. Mine was truly wonderful. I was able to relax, clean up the house, and enjoy some time with family and friends. Now it’s back to the grind of work and school. Dear Lord, I come to you as humbly as I know how thanking you and praising you for a new day. Thank you Lord for being God. Thank you for protecting my family while we slept and allowing us to get up to see a new day. Lord thank you for watching over every person who is reading this blog this morning. Father, forgive us for we are sinners. Forgive us for the sins we committed in our thoughts, actions, and speech. Please reveal the things that we did unknowingly so that we may bring them to you for correction. Lord I ask that you cover each and every student who is going to a new daycare today, cover those who are returning back to school. Place a hedge of protection around them as they travel and return safely home this afternoon. Lord I pray that you be with the teachers. Guard their minds and protect them. Place in them the desire to care for the children. Place in them the compassion and patience to deal with a large number of students. Lord I pray right now that you hover over each and every school in this country. LORD, it’s in GOD that we trust! We need you, we love you, we adore you, we honor you, we trust you. Lord watch over every college student who is near and far. Give them the fortitude to resist temptation. Give them the desire to seek you in their time of need. Watch over every one pursuing higher education. Lord I pray for balance with you, family, self, home, ministry, work, and so much more. Give everyone the ability to balance their busy lives. Lord allow us to call on you throughout the day. Lord we love you and praise you in advance for all that you are to us. It’s in Jesus Christ name we pray, Amen! Have a blessed day! 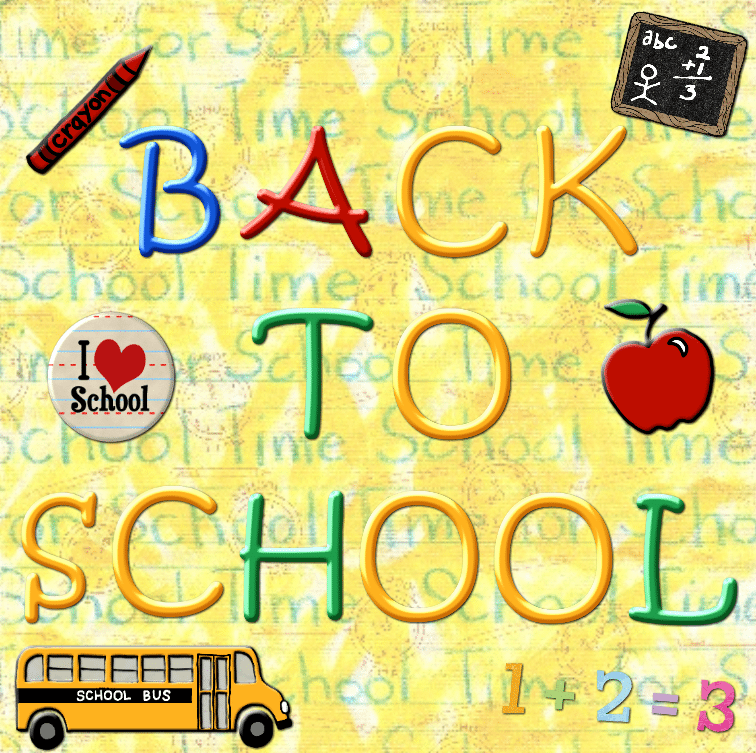 Happy First Day Back to School!